Just wanted to say thanks so much to everyone who came out for the 12th edition of our famous SWERVE 'N' CURVE SCOOTER RALLY. It is now the longest-running rally still going on in all of SoCal. Over 120 scooters cruised out for this rally, making it our best turnout in years. We met Friday night at the Palos Verdes Bowl, a cool bowling alley that has been around since 1958. The bar/lounge area made for a perfect old school location for the traditional rally Meet 'N' Greet. Big thanks to Mary Ann and Babette for selling our rally packs at the Bowl. Much appreciated, girls! Then, we went for a quick, but cool night ride. We stopped just after passing La Venta Inn, in order to get a great view of the L.A. basin at night. You can see from Ventura all the way to the Inland Empire from up there, and the lights make it that much better. We ended the night ride at one of our favorite watering holes, a place we've been going to as a club for years, Hennessey's Tavern in Redondo Beach. After some good suds 'n' grub, we all headed home to get ready for the next day's big ride. Saturday morning, we all headed to the day ride meet spot which was The Shellback Tavern, a pub that was right in front of the Manhattan Beach Pier, in Manhattan Beach. This is the ride that everyone and their mom seemed to come out to, as we reached, and some say far surpassed, the century mark, in terms of number of attending scooters. It was amazing! When we took off from Manhattan Beach, we headed south through the South Bay beach cities, hitting Hermosa Beach, Redondo Beach and up and into Palos Verdes for the famous Swerve N Curve route. Plus, we actually picked up even more scooters and riders along the way who were waiting for us, and who just joined in on the spur of the moment!! As for the ride, we mixed it up a bit this year, as we dipped into San Pedro and hung out at the Korean Friendship Bell for some time. After the break in San Pedro, we doubled back a bit and came back to ride the "switchback," better know as PV Drive East. This is a nice steep road, with lots of twisties, that skirts along the east side of the Palos Verdes peninsula. It's got great views of the L.A. Harbor, if you slow down long enough to view them, and can afford to do so on such a twisty road. After heading down the hill and into Torrance, we headed for Alpine Village, home of "Oktoberfest" and great imported beers on tap and good food. Once there, we had a scooter show and contest. Judging took place and awards were given. Congrats to Rich Sihilling for winning the "Best Vintage Scooter" award with his chrome, black and pink-flamed vintage Vespa Rally. Congrats, also, to Bret Ingraham for winning the "Best Modern Scooter" award with his custom and Malossi equipped modern Vespa LX150. Thanks again, to Mary Ann and Renee, for practically selling all of the remaining rally packs for us - you guys were awesome. Gracias also goes out to all of our traffic blockers - the ride could not have gone as smoothly as it did without you!! Saturday's day ride ended up taking so much out of everyone, that not as many people showed up for the Saturday night ride. Still we had a good group that again met at the PV Bowl in Torrance, then rode to Ashley's Bar in Long Beach. Special thanks goes out to Jesse Trejo and the Long Beach Sound Society for hosting a cool Saturday night event to end the rally on a good note. If you'd like to see some more pics from the rally, just click on this link. Again, thanks to all who came out, helped out, and enjoyed another fun Swerve N Curve. We'll see you all next year for "Lucky Thirteen." 7PM: “Meet ‘N’ Greet” at the PALOS VERDES BOWL, 24600 Crenshaw Blvd., Torrance, CA 90505, (310) 326-5120. Early comers can get the first crack at getting rally packs here. We'll be in the bar/lounge area if not outside. 8PM: Leave for the Night time Beach Ride in the South Bay. 9PM: End the ride at Hennessey’s Tavern Redondo Beach, 1712 S. Catalina Ave., Redondo Beach, CA, (310) 540-8443. 11AM: Meet at the SHELLBACK TAVERN (@ the Manhattan Beach Pier), 116 Manhattan Beach Blvd., Manhattan Beach, CA 90266 (park in the free motorcycle parking area in front of the tavern)**. **Those who need to unload off of trailers or trucks can park them in the Target parking lot, located east of the pier, at the intersection of Manhattan Beach Blvd and N. Sepulveda Blvd. After unloading your scooters, you'll just have to ride west on Manhattan Beach Blvd until you get to the pier. Be sure to get your RIDE MAP for the day's ride, which will be handed out here. Rally packs will not be available here but will be at the end of the ride (see below). 12noon: Ride leaves for the famous South Bay Swerve 'N' Curve route around Palos Verdes. 2/3PM: Ride will end at the world-famous ALPINE VILLAGE INN, "home of Oktoberfest," 833 Torrance Blvd., Torrance, CA 90502, (310) 327-4384. Park your scooters along the north side of the restaurant, on the bricks. SCOOTER SHOW & Judging to take place upon arrival; Trophies for "BEST VINTAGE" & "BEST MODERN" Scooters will be awarded within the first hour. Rally packs will be available. Enjoy some mod/ska/scooter tunes while you're sampling Alpine Village's great assortment of German, Belgian and craft beers on tap. 6:30PM: Meet at the PALOS VERDES BOWL, 24600 Crenshaw Blvd., Torrance, CA 90505, (310) 326-5120. 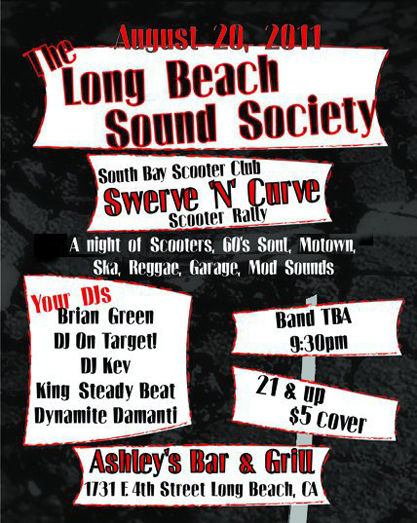 7:30PM: We leave for the NIGHT RIDE to The Long Beach Sound Society's Swerve N Curve Event at Ashley's Bar & Grill, 1734 E. 4th Street, Long Beach, CA. 21 & over; $5 Cover. Last chance to get rally packs, if there are any left. For all the event details, go to this link. *The image at the top is the design that the patches and t-shirts in the rally packs will have on them.